This is my family: Vanished without a trace. . . . Justin and Libby Denbe have the kind of life you'd find in the pages of a glossy magazine: A beautiful fourteen-year-old daughter. A gorgeous brownstone on a tree-lined street in Boston's Back Bay neighborhood. A great marriage, admired by all. A perfect life. This is what I know: Pain has a flavor. . . . When investigator Tessa Leone arrives at the crime scene in the foyer of the Denbes' home, she finds scuff marks on the floor and a million tiny pieces of bright green Taser confetti. The family appears to have been abducted, with only a pile of their cell phones and electronic devices remaining. No witnesses, no ransom demands, no motive. Just a perfect little family, gone. This is what I fear: The worst is yet to come. . . . Tessa knows better than anyone that flawless fronts can hide the darkest secrets. Now she must race against the clock to uncover the Denbes' innermost dealings, a complex tangle of friendships and betrayal, big business and small sacrifices. Who would want to kidnap such a perfect little family? And how far would such a person be willing to go? This is the truth: Love, safety, family . . . it's all touch and go. Great story...keeps your interest...will make a great movie! Narrator does a great job. I really enjoyed listening. Loved the narrator and the twist at the end. Great listen! Love love Lisa Gardner! She is a fabulous writer! Couldn’t wait to go to work and continue to listen! Enjoyed the book from beginning to end. I have read another Tessa Leone novel, called crash and burn. The crash and burn was I Think a better Tessa Leoni novel. but none of these compare to the DD warren novels. Crash and burn was really good but the best was Find her. So far as I have read the DD warren novels are far more deeper more and more character based. The best one so far is Find her the latest one. The narrator is excellent. Awesome book! 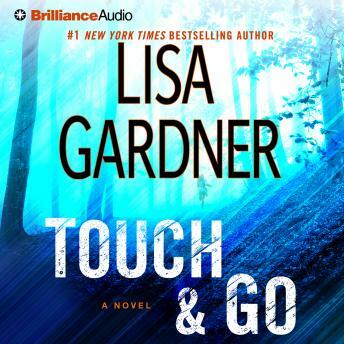 Lisa Gardner is one of my favorite authors, I got so excited to see she had a new book out, and it did not dissapoint!